Again this is a heavily overdue post! I actually completed this challenge way back in February, but as life became far too hectic to maintain the blog for a few months writing this up fell to the bottom of the to-do list. The choice to do this in February was actually a bit strategic… As the shortest month of the year! I am terrible in the mornings, I am definitely not an early morning person. That being said I am at my most productive and highest functioning brain activity first thing in the morning. I also feel a bit gross spending hours extra just lounging around in bed too and weekends are extremely precious nowadays so I feel like I have to maximise every minute I have! Many of you will be aware that I travel away from home for work – I am a Fly In Fly Out (FIFO) worker. I fly approximately 2 hours north of Brisbane to a small town called Moranbah then drive about 30 minutes north to my work site. I fly out on Monday mornings and back on Friday evenings, so I have every weekend at home. It’s nice to have all my weekends free, but it is fairly draining. The bonus for this challenge is that my work start time is 6:30, so I’m usually up at 5am, in fact 4am on Mondays to get to the airport on time. 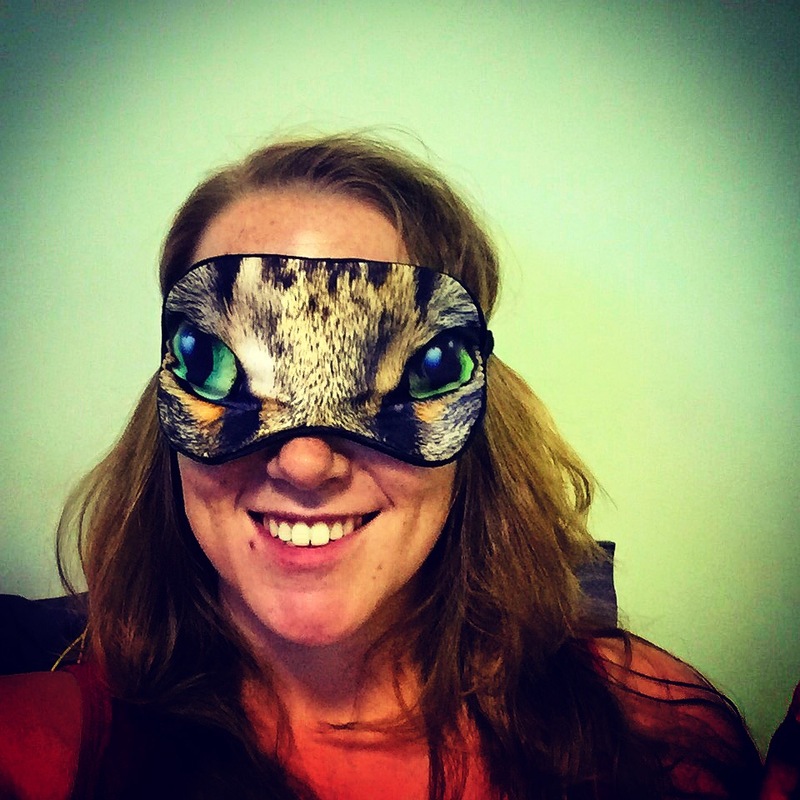 I even have this funky sleeping mask for on the plane… always it doesn’t always work. Queensland is at its best first thing in the morning, before the heat and humidity winds up for the day. Driving to work and watching the bright orange sunrises over the bush is really pretty. So I had 4 working weeks and 4 weekends… should have been pretty easy really…. I was slightly dubious that I would even succeed on Day 1, as I had been to a music festival the day before and gotten to bed fairly late! However, because of the work routine I now just wake up automatically and was wide awake by 7am and raring to go… I was also super excited as it was the SO’s 30th birthday! The days at work don’t count so much as I was up easily anyway and they flew by. 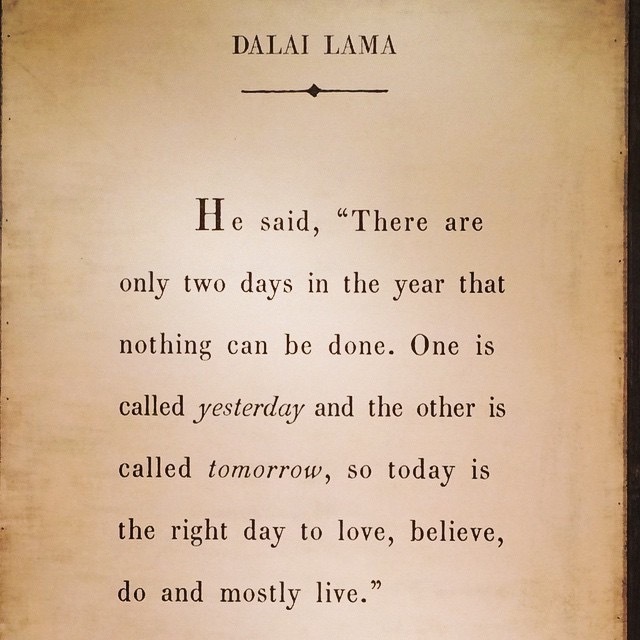 I found myself awake by 6:30 every weekend I had free anyway… except for the final day of the challenge – the 28th. I had had a long and tiring week and just wanted to sleep in. I had felt that as the month wore on I did need a bit of extra sleep… just 1 lie-in! But no I managed it and woke up at 6:55… Done! That’s being said I really appreciate it when I do get to sleep in now, it always feel like a real treat! #30 on my list was originally left blank so that I could add something new part way through the year. I decided that I would go to high tea as this is something I haven’t done in a really long time and is always a really nice afternoon. This is related to a combination of annual leave allowance and the big one… money. Heading into the red centre is really quite expensive and I just can’t work this into my work schedule, as I would really need to take 2 weeks off to fit in the Larapinta Train, or even a decent chunk of it. I think this will stay on the bucket list though for sure! 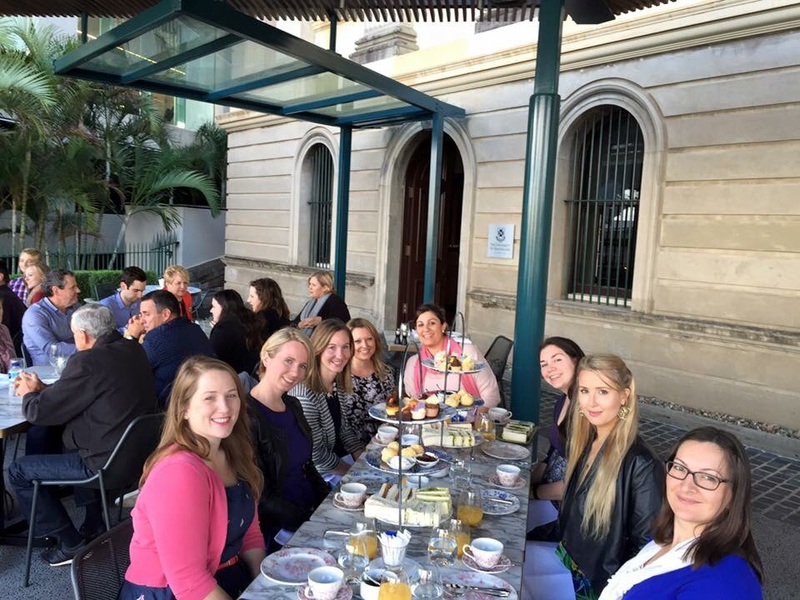 Eight of us headed to Customs House for a spot of mid afternoon tea and petit fours. Customs House is beautiful. It’s one of the few historical buildings left on the Brisbane riverfront and has great views looking over to the Kangaroo Point cliffs and the Story Bridge. On the way there it kept threatening to pour with rain, much to my dismay as I realised that my umbrella had broken. However, we got away with some light drizzle, although it was a bit breezy. We sat out on the terrace enjoying the views and drinking a LOT of tea. Initially we all thought they hadn’t brought enough food out – two cake stands. However, we didn’t manage to finish it we all left feeling absolutely stuffed! On the bottom tier we had finger sandwiches with various fillings. 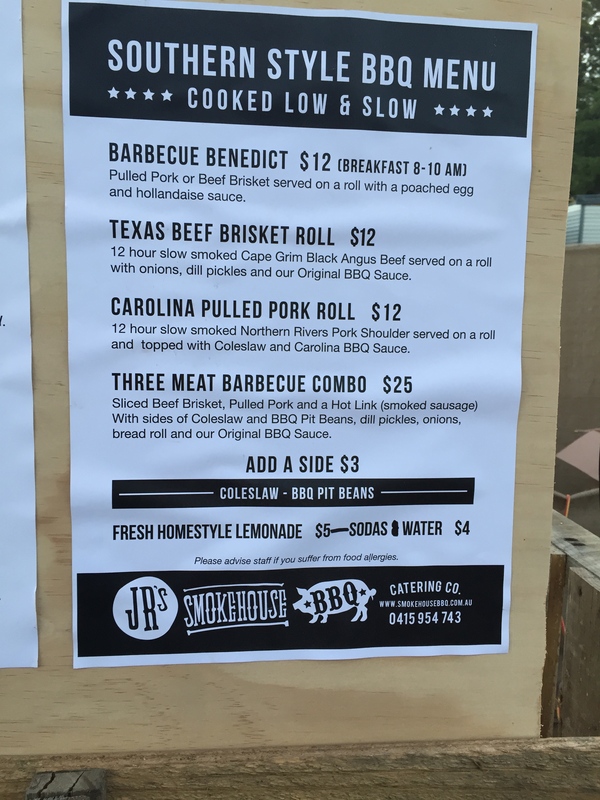 My favourite was the smoked salmon – as usual. I’m a total sucker for anything with smoked salmon in it. The middle tier had cute little fluffy scones with ream and strawberry jam. The top-tier was laden with petit fours and tiny macaroons. Oh my goodness, they were so pretty it felt like a crime to eat them! Every cake was different and we shared them around so we each got to try quite a few. 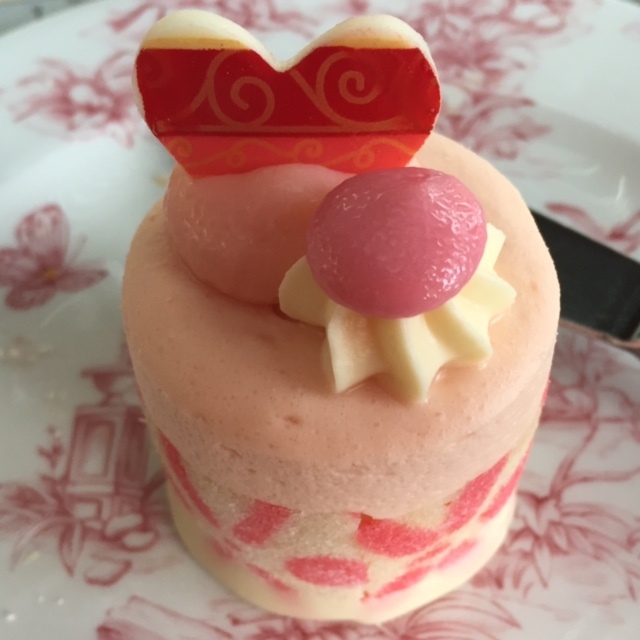 My favourite to look at was the cutest pink mousse wrapped in vanilla sponge. The tastiest was a passion fruit cheesecake… hmmmmmm salivating again. Writing this post is sending me into a full on food fantasy! I would definitely recommend heading to Customs House if you get the chance. High tea worked really well for us now that some people have children and others are pregnant, which makes evening outings a bit more difficult. It was really nice to be able to get everyone together and gave a good gossip. At $45 it wasn’t a cheap date but it was definitely worth it! I have always loved reading. After a slow start as a young child I became a bit of a book worm. I have early memories of trips to the local library, before it sadly shut down. The smell of all the books is extremely evocative. I also remember really clearly hounding my mother in Sainsbury’s supermarket to get the next Enid Blyton book of whichever series I happened to be reading at that time (I’ve ream them ALL). Happily Ecclesall library reopened several years later in a new building, located very close to the old original library. My mother took us out to Totley library after we moved out to Dore and I remember being so frustrated that you could only take 5 books out each and week – how on earth were 5 books a week not enough on top of school works and extracurricular activities!?!? Oh to have that much free time to read nowadays! The last 2 years have been a bit of reading black hole and I found myself only reading when I needed information – which whilst useful is slightly sad. Over Christmas/NY 2014/2014 I went through a phase of reading autobiographies from inspirational business people and entrepreneurs. I also loved Richard Branson’s autobiography – I believe he has several now, he’s such a likeable guys. Although I find the fact that he sells himself as the successful everyman a bit misleading as comes from what sound like a privileged background. However, loved that one too…. I was however, totally scarred after what can only be described as a hard won battle – which put me off reading altogether for months – I almost wanted to throw a party when I finished it! I am very much one of those people that will always finish a book, no matter what -I will not be defeated by literature! But this was serious struggle. This particular book was “Gates: How Microsoft’s Mogul Reinvented an Industry and made himself the richest man in America” authored by Stephen Manes & Paul Andrews. This may be a great, thrilling read for others, but my god it was not for me! However, I survived and was therefore inspired to get back in to reading this year with my challenge #17 Read 3 new books – one of which had to be non-fiction. Or maybe you might want to go and check out your local library even! One Hundred Years of Solitude, Gabriel Garcia Marquez 5/5 This book combines the historical novel with the fantasy and spectacle. I genuinely never knew what was coming next or why, but I was completely and utterly absorbed! I have to admit I was surprised to enjoy this book as much as I did, I truly loved it. I had previously read “Love in a time of Cholera” and hated it, so was unsure how I’d get on with this, also the fantastical content isn’t really my usual cup of tea. Something a bit different for me and I reckon I would happily return to this book in the future. Not That Kind of Girl: A Young Woman tells you what she’s “learned”, Lena Dunham 4/5 I find Lena Dunham to be a very interesting woman. She seems so free and liberated, so confident and assured in her self-expression and her freedom to express it all. I think the content of this book is fairly brave and she even seems pretty unlikeable at times. Again this is a book about someone I outwardly find extremely interesting, but ultimately if I was left alone in a room with wouldn’t feel a close affinity to. There are one or two sections of this book that really hit home with similar experiences I had as a young adult and seen as I read this book in a single weekend I would say it’s extremely readable. My Mother, My Father: On losing a parent, Susan Wyndham 5/5 This was a great and dreadful book both at the same time. I really struggled at time due to the close nature of the content. This book is essentially a collection of essays about how different people have coped with the death of a parent. One Friday on the flight home from work I just had to put it down to stop myself from openly bawling on the plane. This book really touched a few nerves, but it was good, it was both confronting and comforting in that it made me feels things I didn’t want to and also provided the relief of knowing others feel the same way at difficult times. Guns Germs & Steel, Jared Diamond 3/5 Technically I’m still reading this… I keep dipping in and out of it for about 20 minutes on each flight home on Friday. The topic requires a bit of concentration so it’s not exactly a sensible choice for light end-of-the-week relaxation, but it’s extremely interesting. This books discusses how human societies developed in different ways and in different rates in differing continents/locations and therefore, the stages they were at by the time European colonisation started in earnest. For anyone with an interest in understanding how and why our societies’ wealth and power is distributed globally then this is a good book to check out. The best of Miranda: Favourite Episodes, Miranda Hart 6/5 – yes I know Such Fun !!! I do love Miranda hart. I have read all her books and seen all of her shows, except her stand-up comedy, which I am waiting to get my hands on. I just love her, she’s so true and honest and simply just so like us all really. After reading this I had to go back and watch all 3 seasons again back-to-back and cried when they were finished because I felt like I was saying goodbye to a friend – or at least a fruit friend (if you don’t know the reference then get on it). What more can I say but… “What have you done today to make you feeeeeeeeeeeeeell prooooooooooooouuud”. 12 Years a Slave 4/5 Yet another book on my list that was turned in to a film – seems to be a terrible coincidence as I had downloading this one about 2 years ago and it’s just sat there since. This was surprisingly more readable than I thought and is really rather heart breaking. Coming from a liberal background and given the on-going racial tensions in the USA at the moment, it is interesting to read about the historical relationships. I just find it completely inconceivable some of the things that people can believe, really truly it’s just crazy and that’s putting it politely. I actually might go and watch the film after reading this book – but maybe next year so it’s not too fresh in my memory and I won’t draw direct comparisons. The Longest Ride, Nicholas Sparks 3/5 Ah yes Nicholas Sparks, never fails for a bit of romance.. predictable and cheesy but not vomit worthy… I see this is coming out as a movie this year with a highly modified plot. I will likely watch it one night when I’m on my own in my PJs with a bottle of wine and a take away… Classing it up Bridget Jones style of course. Every now and again I just want to get lost in something romantic, I think I am a bit of die-hard romantic, even if not many get to see me be really open about it. Embrace the naff, take a strong whiff of Emmental strength cheese and throw yourself into it knowing fully what it is and you’ll enjoy it… otherwise stay away I reckon. Good beach read. Tracks, Robyn Davidson 5/5 I really enjoy books about expeditions and have read quite a lot over the years. Robyn Davidson crossed from Alice Springs to the Western coast of Australia with 3 camels, largely unsupported. Her trip was, rather reluctantly, funded by National Geographic, who sent out a photographer to record certain points of her journey. I enjoyed this book, the scenery and the wildness and remoteness of what she did has a strong draw In books like this there’s always the need for the writer to justify and try and explain why they made the choice to undertake the trip that they did. I feel that when this information is offered it is interesting but almost superfluous as I think you’re either a person who gets it or doesn’t with respect to ‘adventuring’. I feel like I am constantly fighting the urge to run off and spend my life wandering, travelling, exploring, experiencing. It’s not because I want to run away from my life in anyway, it’s just this feeling, this niggle in the pit of the stomach that can only be satiated for so long… Whenever I read books about people making long painful journeys, climbing mountains etc, I never think why, I always think – how and when can I do that… I only wish I got to do more of it. I’m definitely going to keep up with my reading streak, so if you’ve got any good suggestions let me know! If you decide to check out any of the above I’d love to hear your thoughts too. I reckon I agreed because back in December it seemed so very very very far far away! But oh no, it came round extremely quickly and on May 31st I found myself trekking through the d’Aguilar range. 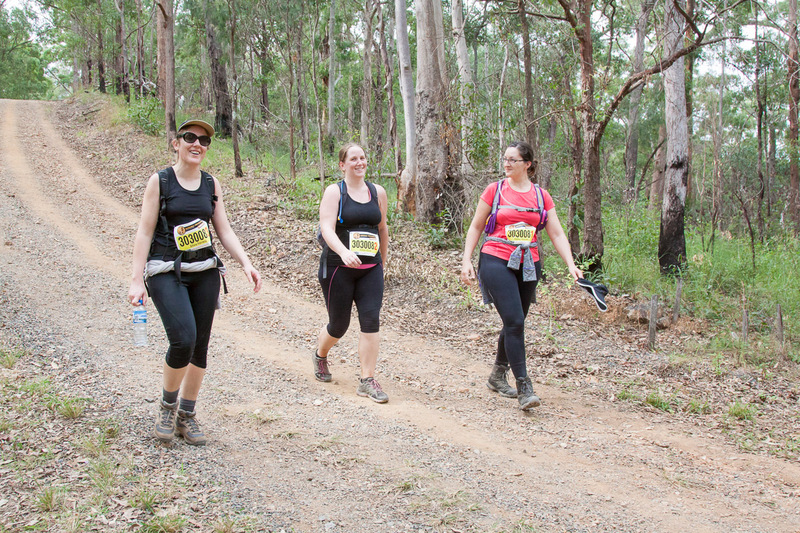 The Kokoda Challenge is run by the Kokoda foundation and raises money for youth programs. There’s a real great video here that explains the work of the foundation, which I recommend you check out. I entered the challenge as part of a team of 3 the “GeoGals”, with my colleagues Ester and Silvia. Together we did various amount of training… although I definitely didn’t do enough. Silvia is a natural born mountain goat though! 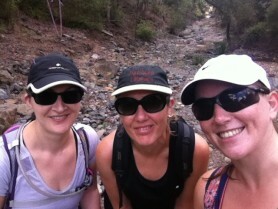 To get hill-ready I did a mixture of 10km to 18km walks around the Brisbane area. We started off gently with a nice morning 10km around Mount Cootha, finishing with ice creams at the café at the end (how every hike should finish). Esther and I had a lovely walk around Brighton where we can across an awesome Mid-Century furniture warehouse, which rather slowed out pace down! 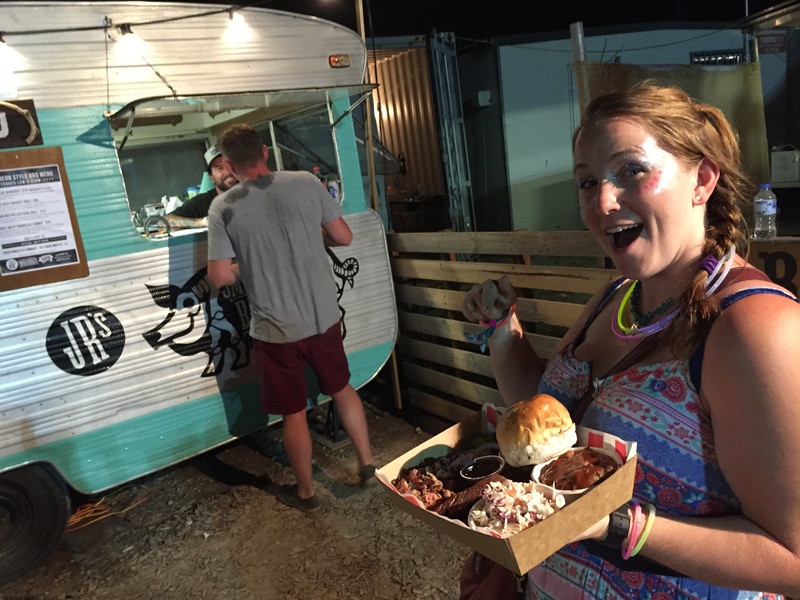 We also had a fun trip out in the sunnie coast hinterland; although we were so hungry by the end of it we might have ended up in KFC in Caboolture! I blame that on it being a public holiday and there not being any other options open… We did look for a café… really we did I promise! The last group training walk we did was around the Lamington National Park and was guided by Silvia’s friend Rodney, who is actually a former park ranger. It was such an interesting hike, as he talked about all the plants and trees and knew a few bushwhacking “short-cuts”. One side jolly took us off to a perfect picnic spot on the edge of an 80m cliff overlooking the rest of the range. You could see out across the valley all the way to the coast. I also tried to get to the gym and out running too, but unfortunately work has rather taken over recently and I didn’t get out half as often as I should. 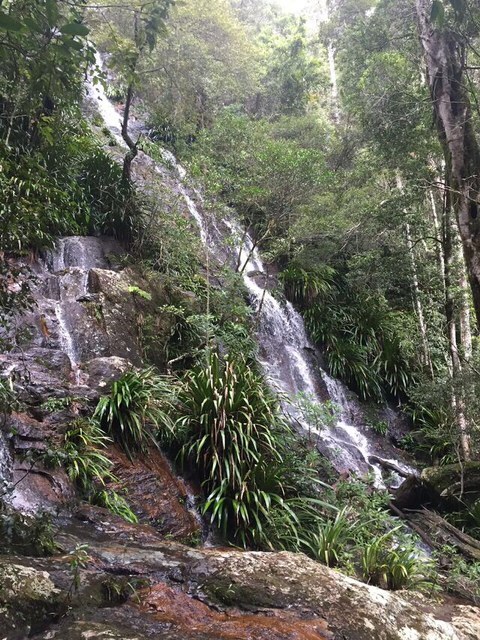 The Kokoda challenge is the shorter version of the replication of the Kokoda track, which people complete both in the original location in PNG and also in the Gold Coast Hinterland. 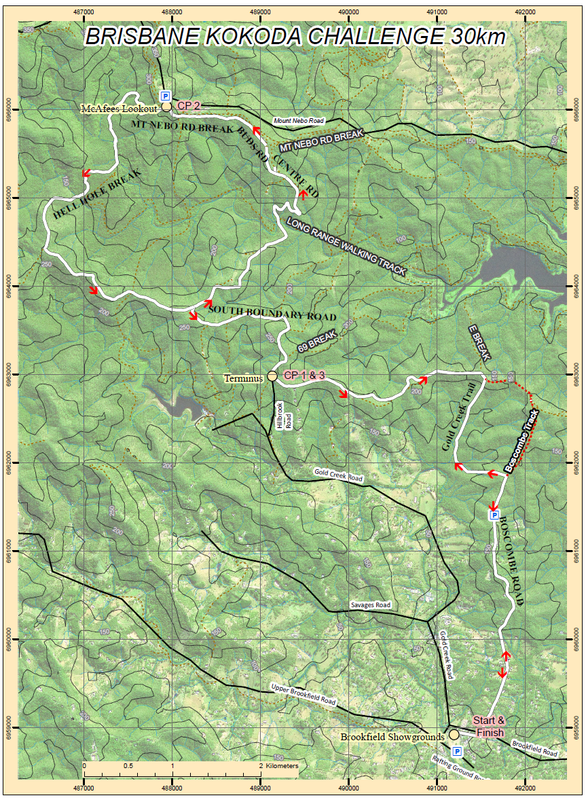 For those who aren’t familiar with the back story, Aussie Diggers had to cross 96km of PNG bush tracks in the Owen Stanley Ranges in a period of 36 hours and then go to battle. Amazing. The setting within the d’Aguilar range is reckoned to be fairly similar terrain to PNG, albeit less tropical. 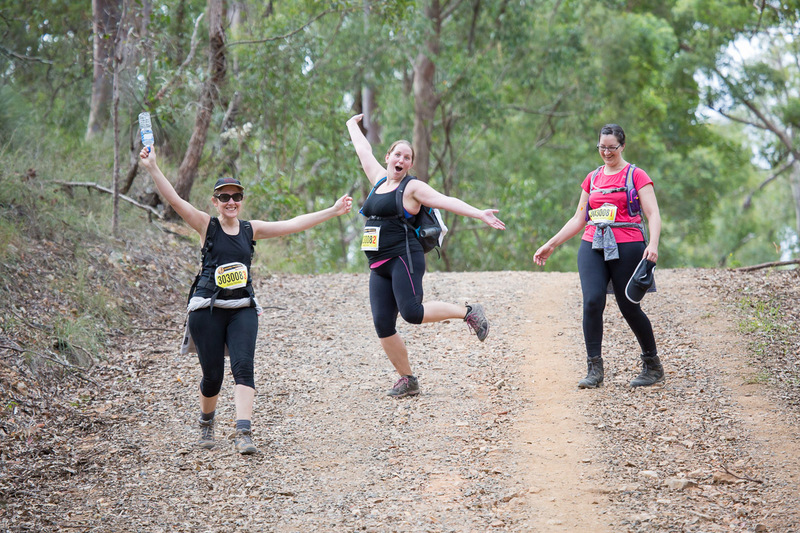 The walk starts at Brookfield showground and winds up to McAfee’s Lookout and back. 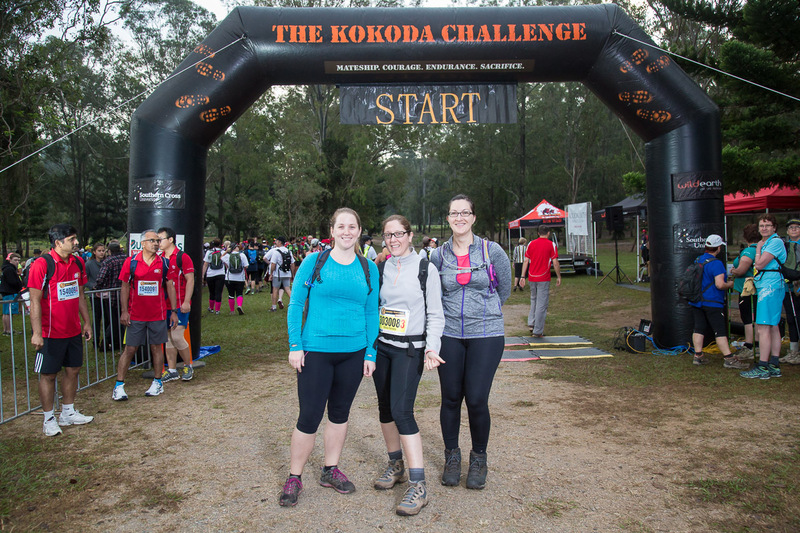 The challenge is run to raise money for the Kokoda Foundation and we had a minimum fundraising requirement, which we smashed. I believe that the fundraising page is actually still open and that you can still donate to sponsor our great effort here! Overall we raised about $500! The walk started as the sun was coming up, with all 1000 participants setting off under a large banner. The runner disappeared fairly quickly, but most of the walking group stayed fairly close together almost until the first check point. I wasn’t feeling all that good on the morning of the walk unfortunately. I was struggling with pretty bad nausea for most of the morning, which didn’t help climbing hills. 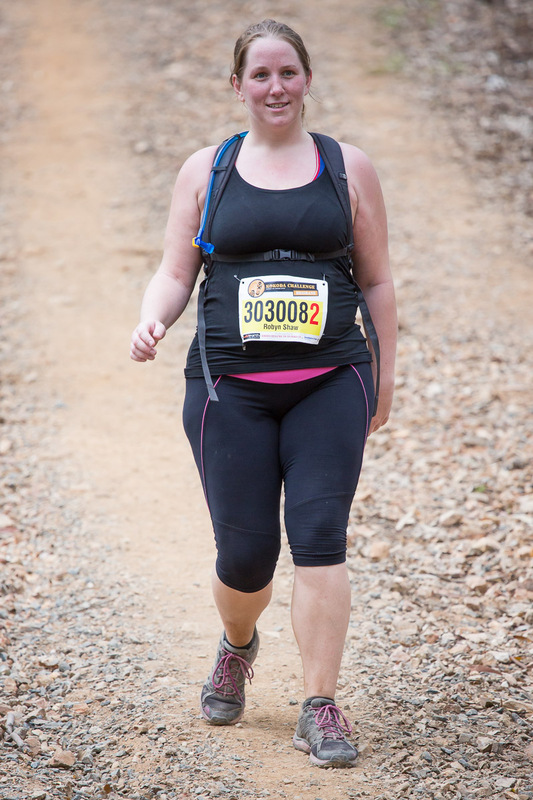 I had lots of great snacks to keep me going though, so I kept on. I also struggled with the hills a bit more than the others. 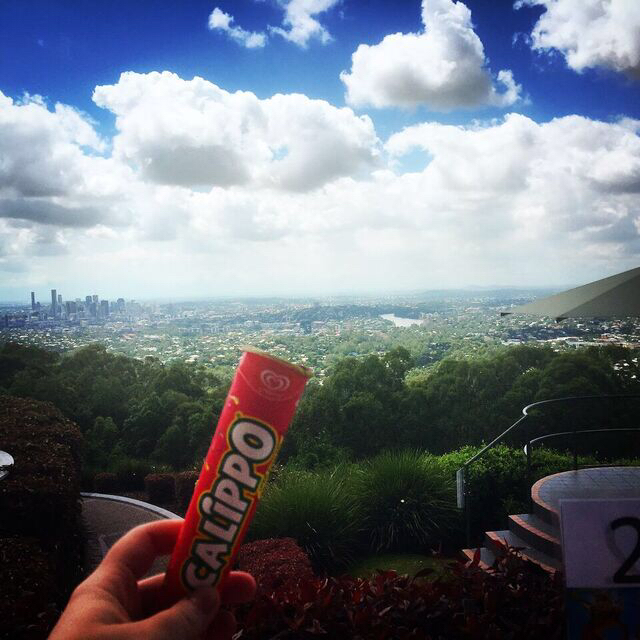 It turned out to be one of the hottest days in a long time – 29 degrees, which for autumn is not cool man! Combined with the 100% humidity I was pretty much (or rather not pretty at all) a human puddle all day. Once we reached the first check point I think we all relaxed a bit. There was a really great vibe with all the people around and it was pretty fun. After fuelling up on jam sandwiches, dried apricots and a good drink of water we were off again. The third section was the most testing I reckon. The groups had seriously thinned out by then and there were some seriously steep sections. This included the “hell hole” which was really very steep – although Silvia almost bounded up it! 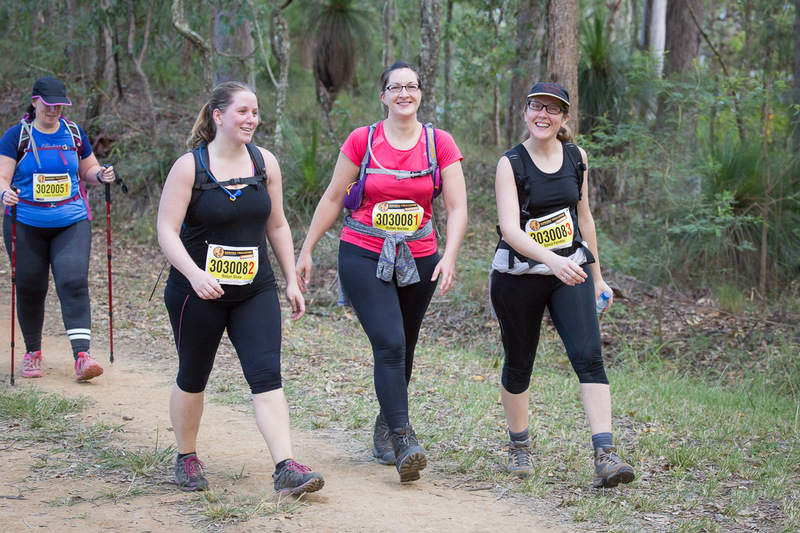 Between the 15-20km mark we were walking at a similar pace to one of the Kokoda foundation youth groups, who do the 30km walk, the Gold Coast 96km walk and then the PNG walk too! We were all so impressed with how motivated, polite and generally great all the kids were. It was very impressive. In fact there were a lot of extremely impressive groups of kids participating that day that completely put us to shame. It felt like the final check point was going to be around every corner. By this point the endless feeling of walking uphill was starting to grind us all down a little bit. It felt like the last few kilometres in this section took a lifetime and I think we might have gone a bit mad in the last 50m when we spotted it! Reaching the road and knowing we were walking the last 2-3km at the end really helped to motivate us through the pain towards the end. It was really great to cross the finish line all together. I think we made a great effort and I’m super proud of us all. That night I sat in the bath for over an hour and was fast asleep by 7pm! The next day was walking a bit like a granny, but I surprised myself and recovered pretty quickly. I did make myself go walking, do yoga and bodypump to get rid of all the lactic acid build up though, which I reckon definitely helped. I’m really proud to have ticked this one-off, but am glad to say it’s done and that I won’t be doing this again. 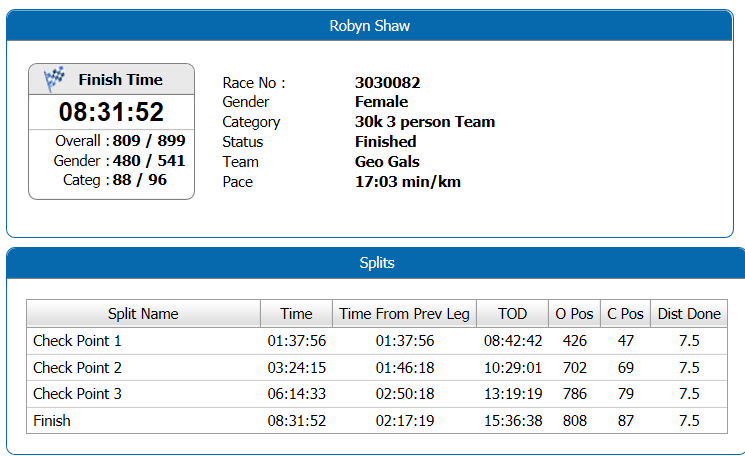 So the fastest team completed the challenge in 3 hours and 28 minutes… crazy people – but what an amazing achievement! We finished in the respectable time of 8 hours and 31 minutes. The slowest team took 9 hours and 22 minutes, which was technically after the cut-off time. 200 teams finished, 50 dropped out. Over 1000 people participated in all categories. Team GeoGals came in 87-89th out of the 3 person category. April & May have come and gone in the blink of an eye. It rather seems I am failing at monthly updates – but when you have 8 days a month to function like a normal person it’s actually quite hard to keep up with this blog – I won’t lie, it’s felt like a struggle. I know I said the same thing last month but it really does feel like this year is happening in fast forward! I have to get on with posting my extra blog posts too – as I have completed a whole bunch of fun things! I’ve also actually written them – so am going to set them all to auto-post weekly over the next few weeks each Friday afternoon so keep your eyes peeled and feel free to share the love. 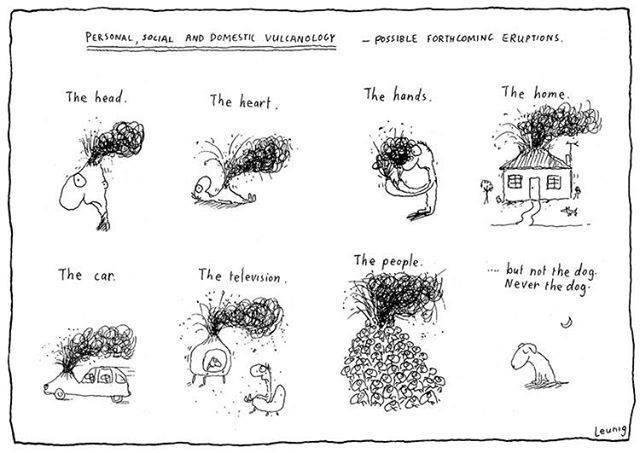 This month though I have been feeling pretty inspired by the work of the much loved Michael Leunig. 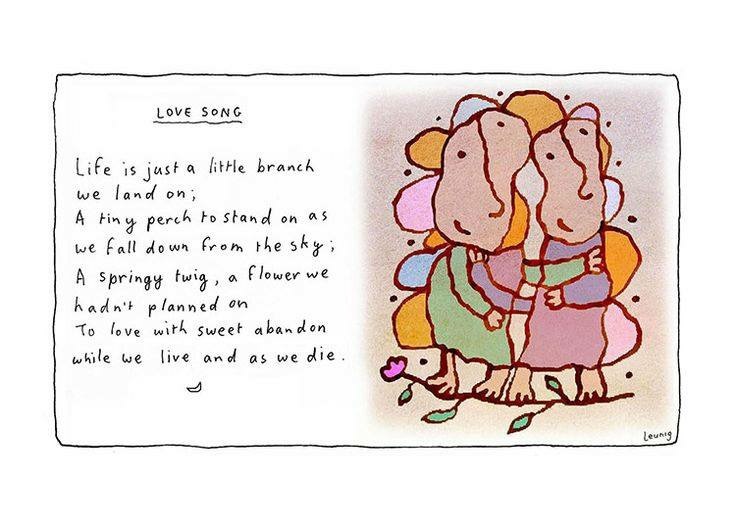 I have been following his work for a while and as a member of the Michael Leunig Appreciation society on Facebook I get to see his lovely pictures, poems and thoughts most days. I find many of them gently amusing, other more politically charged posts generally align with my world views. Life has been treating me pretty well this year, apart from work-related stress, which is really just a given. I saw this is about a week ago and it really amused me – just trying to enjoy the little pleasures of everyday life and not let things get on top of me.Being away from hope Monday to Friday, I really find I enjoy small moments at home when I’m having a quiet weekend (rare). Mark shared this with me after a conversation we had the other night when I was expressing how I currently feel towards my career (or lack thereof) and how I have reached a point where the potential for higher financial rewards are just not worth the associated stress. It just perfectly summed up how I had been feeling about life and the rat race and starting me thinking about longer term change. 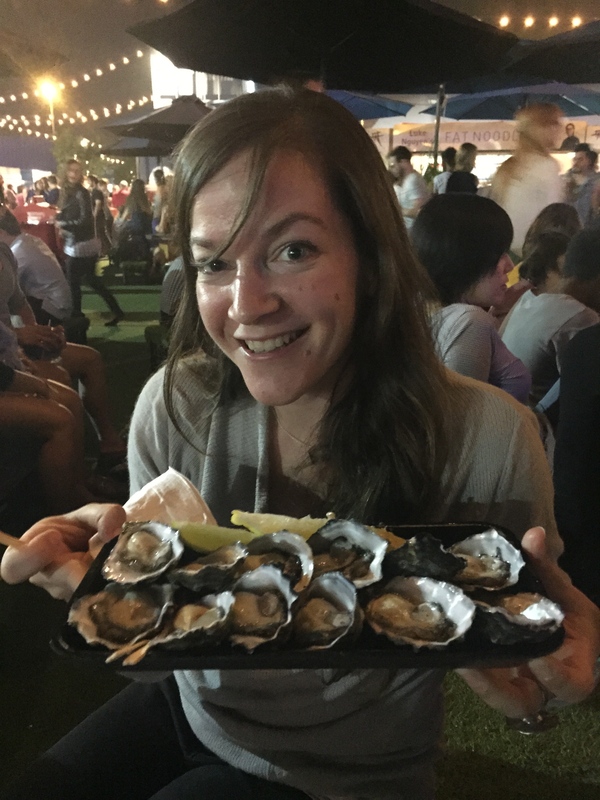 I’m not good with stress and struggle with anxiety, which I have to actively manage – somewhat successfully it would seem, as I was then asked in a surprised voice whether I got anxious! As I don’t have a vocational career there’s no end goal, no attainable stage of enlightenment or ability to reach, just continued layering of pressure and volume of deliverables. I have been feeling increasingly that I just want to work for myself, to be answerable to myself and reasonable for my own decisions. I would love to have a small business… I think I’m still a way off taking the plunge though. The main point of this year’s challenges was to inspire myself to achieve goals and get out here and live life to the full. Recently I have gotten bogged down in the day-today and work-life struggle and fallen off the bandwagon a bit. Therefore, this month I going to get on with organising the things important to myself, be more proactive and not put things off… It’s so easy to say “oh next time, next weekend” or “I’ll tell them next time” so in June I’m going to try and be more in the today. This month my cooking has been super basic and uninspired… I have been trying to work through leftovers in the freezer. 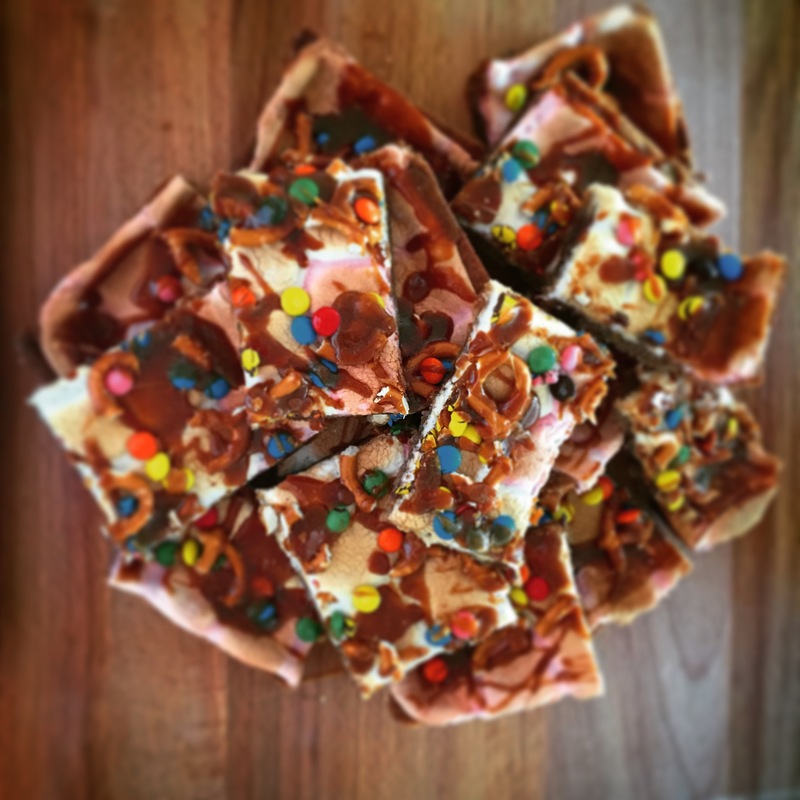 They’re both super simple and both baking related… used as bake sale items for Kokoda fundraising – more about that later! So first up I have super mega chocolate cupcakes. i.e. 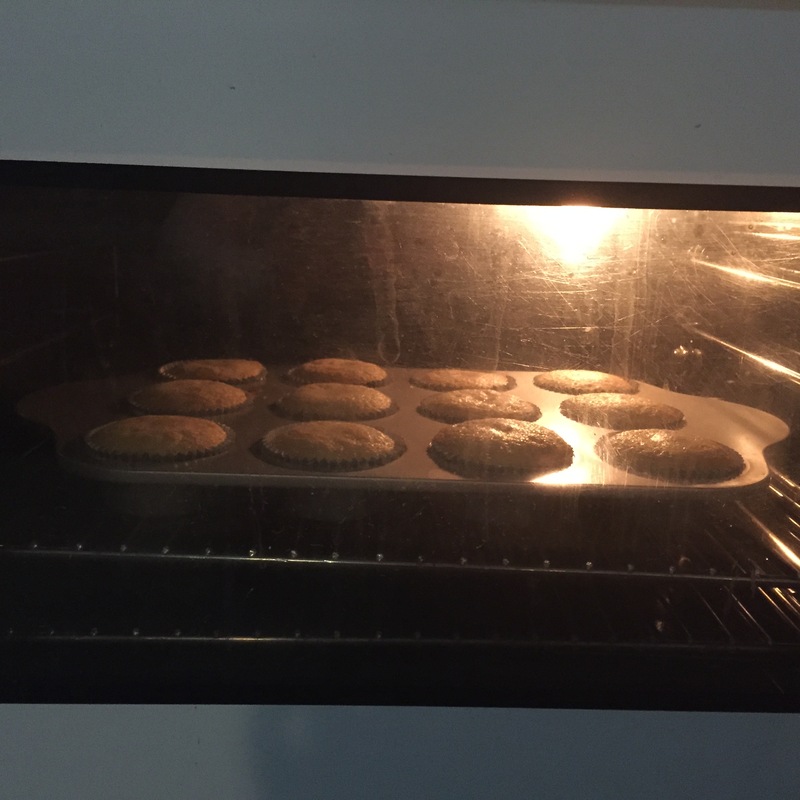 I use 6 oz of flour etc and 3 eggs to make about 12 cupcakes or a small double layered Victoria sponge. Beat your sugar and butter then fold in the flour and eggs, alternating small volumes. Then give a good old fix – carefully to fold, rather than beat so you make your sponge all nice and light. Whip sugar and egg white over bain-marie consistently until it reaches 60 degrees (so you don’t give everyone salmonella). Then transfer to mixer and whip on high setting until smooth, glossy and soft peaks. Then add in small amounts of butter until you think it’s reached the rich butter cream consistency – this should be like a whipped mousse texture. This frosting is super intense in flavour and like velvet mousse in texture – wonderful! You need a plain or light cake base though, at the chocolate is so potent! Although orange or mint might work really well too. They then got packaged up in my trusty cupcake carrier and taken to work – airport security threatened to confiscate them as a “tasty-tax”. 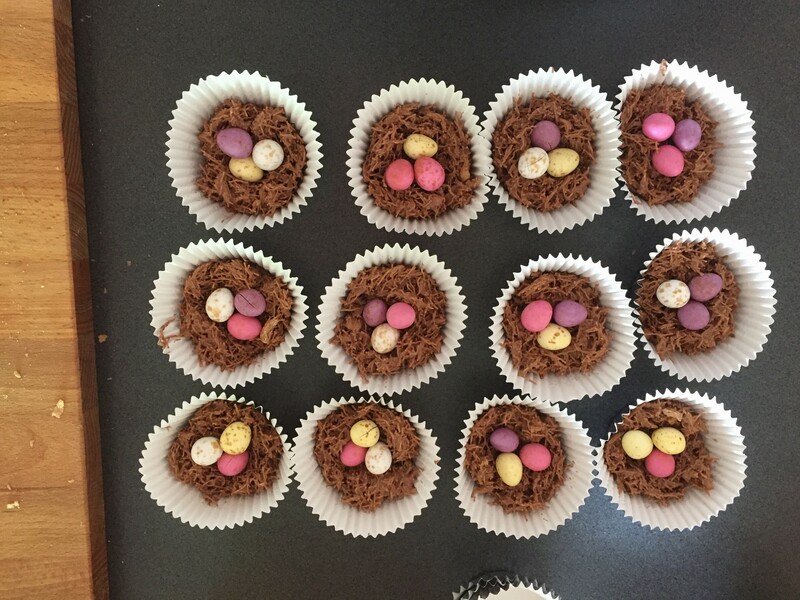 I also made Easter nest cakes – i.e. 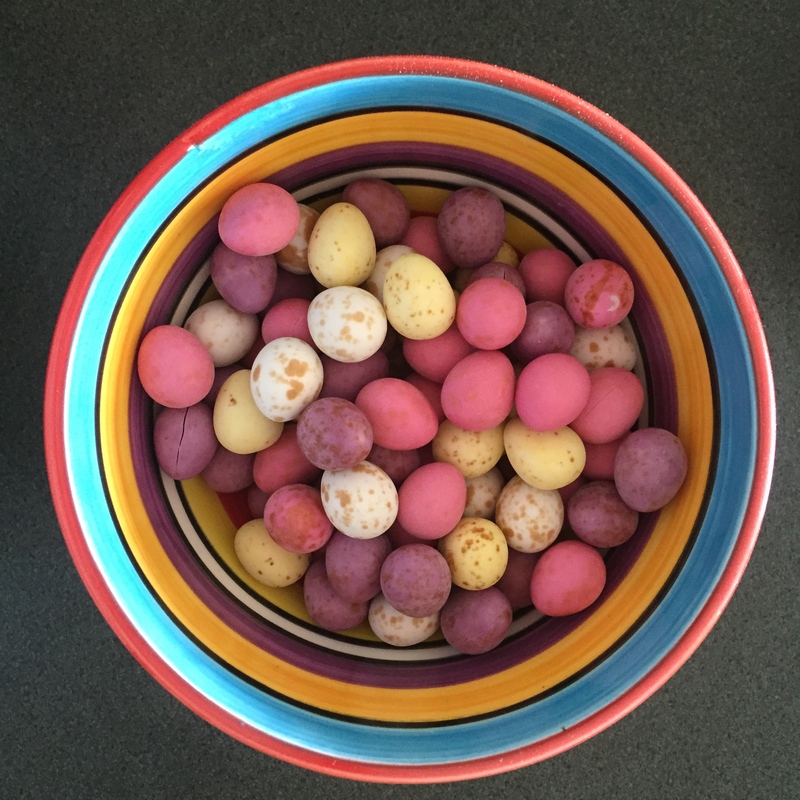 chocolate covered shredded wheat with mini eggs in the centre. They went down a treat and I raised almost $50! I tried making these with shredded wheat to give a better nest-like texture, as opposed to other cereals like corn flakes you see other people using. This is technically not a new recipe so I guess it’s kind of cheating, but I had only made s tiny test batch before and made a huge tray this time. Essentially they have everything you could want out of a sweet treat bar… salty, sweet, hard, chewy. Everyone at work loved these – although I had to stop eating them all myself. Seriously give them a go! I’m just a bit nervous when I make caramel as I am SO accident prone and sugar gives the worst burns –but I got it perfected! 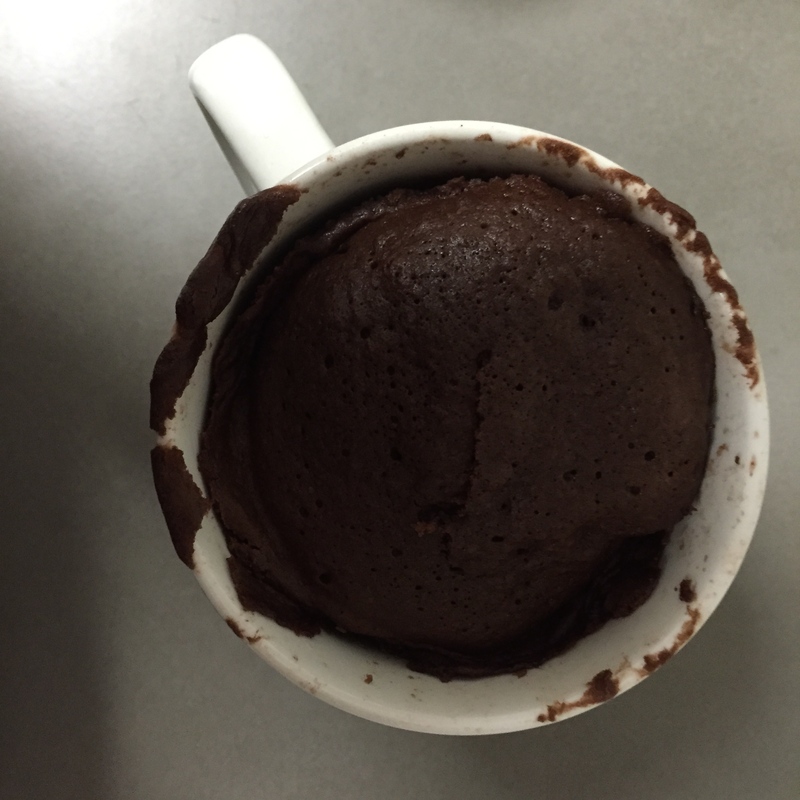 I also tried making chocolate mud mug cakes with Sam. This involves mixing flour, oil, sugar, cocoa and milk and microwaving. We tried various lengths of time, but it they still came out too dry, even with ice cream. But they were quite fun none the less. My colleague Sam… for generally lightening the mood, having a good chat, tea appreciation skills, sending me endless silly gifs and feeding me chocolate (#thanksbutnotthanks). And also – this is a big one…. Letting me come over to watch new episodes of Game of Thrones on his big TV…. Sam has also been my biggest sponsor to date for the Kokoda challenge – paying $7 for a cupcake and another $50 donation! I think we’re two people that are able to communicate on a really open level and provide the right support and inspiration for one another. I never feel like there’s something I can’t say, good or bad and we always have so much fun. Meghan is always into something new, whether it’s new recipes or places to hang out, networking, doing all of the Stadium stomps around the entire of Australia (deranged) it’s always so exciting and motivating to hear about. To my ultimate foodie friend, you always inspire me and lift me up. I love you and am so proud and excited that you’ve got such an awesome shiny new job and new adventures on the horizon. 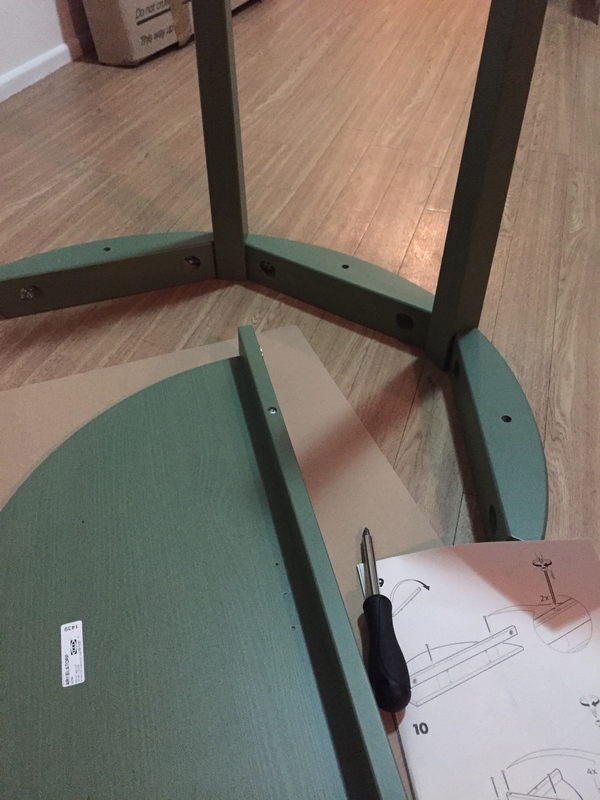 Having used my thankfulness up on people over the last 2 month’s I’m going to get materialistic and get thankful for stuff… Namely cheap flat pack stuff! I have been working really hard to transform my apartment into somewhere that feels like a home rather than living out of boxes (I had a mass clear out of any furniture associated with my old life when I moved). Despite working silly hours and constantly being away from home I haven’t had a heap of spare cash and so I am thankful to IKEA for yet again providing me with a way to make my house (well unit) a home. I love the Story Bridge, it is my favourite bridge in Brisbane. 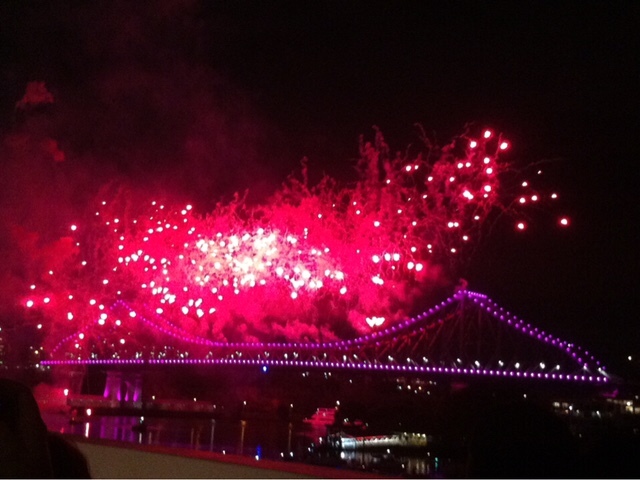 I especially love Riverfire, a big event as pert of the annual Brisbane festival where they have a big firework display along the river and shoot fireworks off the bridge! It’s also my local bridge, the one I travel over when I’m close to home, or off to the motorway to head down to the coast for fun times. I roped in Esther to climb the bridge with me – it didn’t take much convincing though, which was good. The Story Bridge Adventure Experience company runs trips climbing the bridge, abseiling of it etc. all through the day and into the night. We chose to do a twilight climb, which worked out perfectly. The evening was the perfect temperature, the skies were clear and spirits were high. The Story Bridge is a steel cantilevered bridge that opened in 1940 and runs in a North-South orientation, connecting Kangaroo Point to Fortitude Valley and the City. The bridge was named the Jubilee Bridge during construction, but was renamed on opening to the Story Bridge after John Douglas Story, a public servant. Almost 97,000 cars cross the 6 lanes of the bridge every day, with it being one of the main commuter bridges into the city. 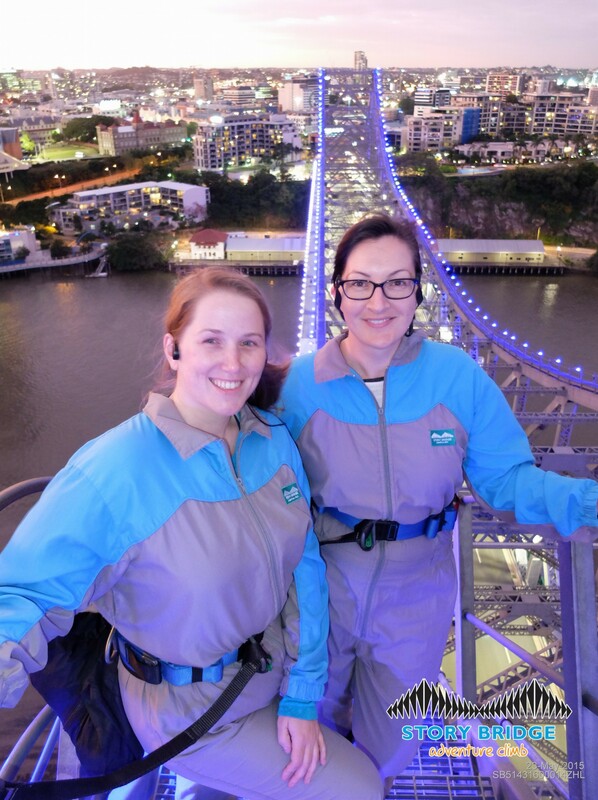 The Story Bridge Climb is one of only 3 bridge climbs in the world – the others being the Auckland Harbour Bridge and the Sydney Harbour Bridge. The summit is approximately 80m above sea level and higher that the Gateway Bridge – which I was surprised by as it certainly feels a lot higher when you go over it. Amazingly only 3 men died in the construction of the bridge. Given the time and the hazardous work/location that is pretty good going. The bridge was constructed using 1.25 million nuts and bolts; however, as so many were dropped from the bridge or were damaged they actually had to manufacture 1.5 million! That’s a whole lotta bolts! The foundations also run to 40m depth on the southern side, which required the use of pneumatic caissons under 4 atmospheres of pressure, which in the 1930s was highly risky work. The bridge also has to be repainted for protection and it takes 7 years to paint the bridge – so it’s almost constantly being painted! Everyone has to be bretho’d before they can start – which seems pretty sensible. Including a 14 year old girl, which amused her father. We then got kitted out in our climbing gear –I’ve never felt more like Anika Rice in my life! You wear super funky jump suits, then you have your “utility belt” that fixes onto the rails to secure you on to the bridge. You get a radio headset – very star trek style, as it doesn’t cover your ears, just sits on the bone in front of your ears instead. You’re not allowed to take any loose items, so glasses have to be strapped on and even my bobby pins were removed! You also get a wet weather jacket strapped onto your belt – it had everything. By the time you’re ready to go you’re quite laden down, and raring to go! To get from the activity centre up on to the bridge you first climb a spiral staircase, which takes you up about 3 stories. There’s then a horizontal platform that runs directly under the road – at this point you clip on to the guidelines. The stairs and walk ways are all grated, I assume to deal with water runoff. However, for a person that isn’t great with heights I was a bit nervous about looking down. Through the walkway section you can see straight down to the ground below and can feel the vibration of the road traffic overhead, it’s a little bit shaky, but not too bad. We walked up the south-eastern stairs and emerged above the road. The first set of steps, which takes you up through the road section, is fairly dark, so it’s quite impressive when you emerge and can see the view. I felt like a meerkat sticking my head up out of a hole. We climbed to the top of the bridge whilst it was still light. From the top the views are brilliant. You can see out east to the airport and the islands. I could almost see my apartment building! To the west you are looking straight at the CBD with Mt Coo-tha behind. To the north all you really see is the valley (less exciting) but you can actually see some of the glasshouse mountains! We were lucky it was so clear! To the south the suburbs just open up before you and you see all the way out to Mt Gravatt and across to Lamington National Park. Many of the others in the group were tourists and so the guide pointed out landmarks. I loved doing this a local as I think you get more out of identifying all the places you know and love. Also as I fly in and out every week I know where most things are aerially so it was pretty easy to pick everything out. You pose for cheesy photos and then head down the stairs towards the centre of the bridge. By this point you’re actually over the water, which feels slightly strange. Although I was initially super nervous about the height it didn’t bother me at all. You feel really secure and it just doesn’t seem all that high. I also think it helps that this is a bridge I’m used to driving or jogging over and that you get distracted by the views. At the centre point of the bridge you cross over to the northern side, walking across a central support, right above the cars. I stopped in the middle to look down and watch the cars zipping by underneath, which was very cool. By the time the sun was setting behind the CBD and the sky was a wonderful orange colour. We then walked back up to the top and stopped to admire the twilight views. The lights of the city had turned on and the sun was low and red in the background. The bridge itself is lit with lights that can change colour. They’re set different colours for events or festivals, such as green and gold for Australian sports matches. That day was the Greek festival, so the lights were blue and white. We got another cheesy photo and started to head down back towards the climb centre. The whole experience was around 2 ½ hours and I think we picked the perfect time of day and the perfect time of year to do it. All in all we climbed over 1000 stairs over approximately 1km! Go us! We then celebrated with tapas and cocktails at a wonderful local restaurant with a friendly possum named Patricia… a great Saturday night out. I’m so glad I did this! So this post is over half a year overdue – whoops! I’m also trying to keep it short and sweet, unlike all my other posts! Towards the end of 2014 I was beginning to feel tired, heavy and generally a bit blah. I was also feeling a bit off meat, not being a huge red meat anyway and decided that January would be the month of no meat. A lot of people asked me what the point was in trying to be vegetarian just for one month. But does there need to be a point really? I started 2015 camping at a music festival down by Byron Bay. I did wonder if that would make it difficult; however, the number of amazing vegetarian food options at the food trucks made it a breeze. When I spotted them whilst looking for the last supper I couldn’t go past… Luckily my friends husband was on hand to share, as I’m not enough of a piggy to manage $30 of meat myself! I love vegetarian food as it’s so full of flavour. I also think that vegetarian and vegan cooking can be more creative than standard cooking. However! Living on a mine works camp is not the place to be veggo for sure! It really was a trial. Some nights there was no vegetarian option at all and I just ate soggy side veggies, which was very uninspiring. I had one terrible experience where they served vegetarian lasagne, which turned out to be vegetable peelings – not evening slice, but peeled including the skins, with a about 2mm of white sauce and cheese on the top. It was the low point of the month for sure. I also had a slip up… A friend cooked me breakfast before I’d had the chance to clue them in and they cooked a great Spanish omelette with bacon. Whilst I managed to not eat too much of it, it was pretty unavoidable and I didn’t want to be rude, especially seen as I was; t doing this on moral grounds. I felt great at the end of the month though, fresh, light and clear-headed. This was not enough to stop me from running at sprint pace back to meat though, although I definitely feel better having reset to only smaller amount of it. 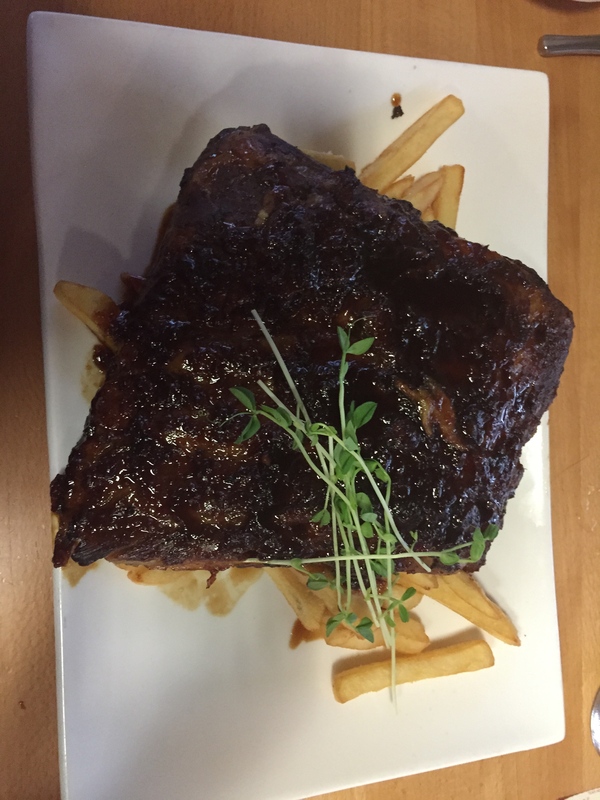 My first meal back to the meat was at the Moranbah Workers Club, where I had BBQ ribs – perhaps not the most sensible choice to ease myself back into it… I felt ill for about 4 days afterwards, but that was expected. Overall it was a great “reset” and I know that I always feel better in myself when I eat less meat, especially red meat.